Indonesian based artist Paskalis Kunang AKA Mr Kumkum once again pulls out all the surprises and showcasing his freaking awesome skills. Whilst making our morning coffee, Mr Kumkum made us pick our jaw off the floor with this custom Jermaine Rogers “Veil: Specimen #72 (‘I Think I Am Losing My Mind’)” Mr Kumkum carries his trademark style thought this custom, together with his 2tone look and serious pointillism painting style Mr Kumkum leaves Jermaine’s silhouette intact whilst giving a totally different look. All about the brush strokes here. We’re a fan of darkness that Mr Kumkum does. No need to overthink, THIS IS FREAKING AWESOME! Especially if those eyes are GLOW IN THE DARK. 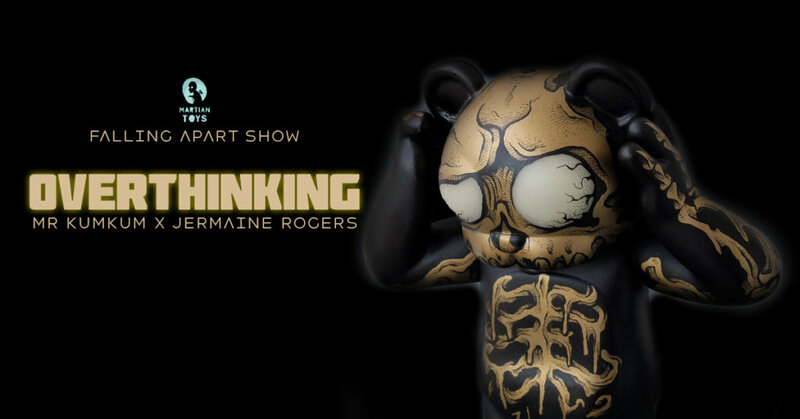 DEstined to be a part of Martain Toys NYCC 2018 show #FallingApart show featuring works by 100 artists based on original sculpt and dero character by Jermaine Rogers. Find Mr KumKum on Facebook, Tumbler and Instagram. Use code: “THETOYCHRONICLE5 ” for a little discount. Keep in touch with Jermaine via http://jermainerogers.com/ Twitter and Facebook. Need your Designer Toy news first, you should look to download our new TTC Mobile App. Designer Toy news direct to your smartphone. No dealing with social media algorithms.